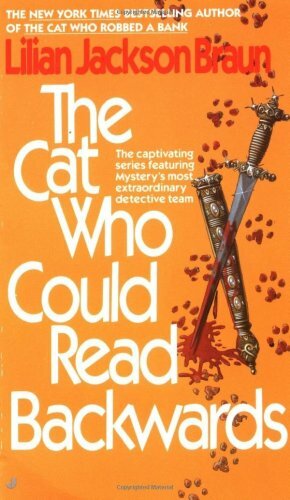 Written in 1966, Lilian Jackson Braun’s The Cat Who Could Read Backwards is certainly not the oldest book I’ve ever read, nor is it one of the best books I’ve ever read, but it was unique because of one of the main characters. Koko the Siamese cat, who can read a freshly published newspaper backwards by tracing the letters and who has a knack for uncovering clues that piece together difficult crimes. This book in a way reminded me of an Alfred Hitchcock film – a lot of build up to a brief yet explosive finale. I suspect this may have been because it was the first in a series, and certain characters deserved lengthy descriptions. With that said, the book was well written, with a dash of surprising red herrings and an almost constant upheaval of what the reader thinks they know about the mystery. 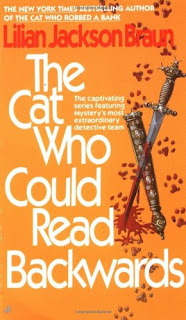 I would go so far as to say that The Cat Who Could Read Backwards is more a mystery than a crime novel, or a cosy crime at that. It may not be as ‘cosy’ as others, like many written by her excellency Agatha Christie, but it is a polar opposite to some of the more grizzly and gruesome crime novels abundant today. In this first story of Jim Qwilleran (Qwill) and Koko, Qwill accepts a job working on art pieces for a newspaper called the Daily Fluxion. He appears to have had a relatively decorated career that took an unexpected halt, but this point isn’t explained at all. Perhaps in other novels in the series? The first half of the novel sets the scene – we meet a handful of exceptional artists, each quirky in their own ways, one bitterly disliked art critic, and of course the masterful Koko. In a nutshell, a pompous critic named George Bonifield Mountclemens III (yes, that’s his name!) has ruffled a number of feathers with his biased and scathing reviews of most of the local artists. He selectively favours a small few, while burning bridges with the others. At first the reader even doubts his existence! But Mountclemens definitely exists, and Qwill finds himself inhabiting a small apartment attached to Mountclemens’ antique and dilapidated home. Within a number of pages, there is a brutal stabbing, an attack by vandals, and a suspicious accident at a small gathering. Something is not right within the art world. I was extremely surprised and almost somewhat let down by the conclusion. I do, however, have a strong liking for the feline component of the novel, Koko. From his first appearance, Koko is described as a supremely intelligent and elegant cat who appears to know a great deal more about the world than an average cat should. The author has a gigantic love of cats that is made abundantly clear throughout the novel, as cats are described positively numerous times. Anyone who knows me even slightly well knows that I too love cats, so this series will hold a great deal of appeal for me. I won’t rush out to read the next, but that’s more because I’m put off by the sheer number of books in the series – over 25 in total! It’s a great idea though, a cat detective. I like it a lot.